I awoke about 6.00am on Friday and the hillside was covered in mist, so decided to have an extra hour in bad. By 7.00 am the mist had lifted but it was looking like it was going to be a cloudy grey day. 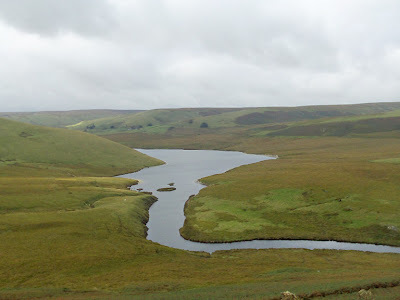 We broke camp around 9.00am and headed West to pick up the Monks trod again at Pont ar Elan, this is part of the Elan Estate and also the area covered by the many reservoirs serving Birmingham and the Midlands. The path climbs in a Westerly direction from the reservoir and eventually plateaus out, it was quite boggy in parts and the path seemed to run off in different directions, there were the occasionally signposts but at time these were 10 to 20 yards away from the path we would be on. Although it wasn't hot; it was hard and thirsty work, and this did cause a problem. Although boggy there wasn't a good supply of water up on the top. At the Llyn Cerrigllwydion lakes, it looked possible to get down to them from the path but once closer, it was a steep climb down and the way back out didn't look to inviting. We pushed on and finally found water, in a small crack in the ground with water running off the hillside. We continued on down to the Afron Claerwen; where we across the river and stopped to have lunch, at this point I realised I'd lost my mapcase, I'm not sure if it was as I was manly striding down the hill or more likely when I bent down in the river to collect water, either way it was pretty stupid and dangerous not to keep my mapcase somewhere safer. Lucky we both had maps; so had to continued on Keith's. 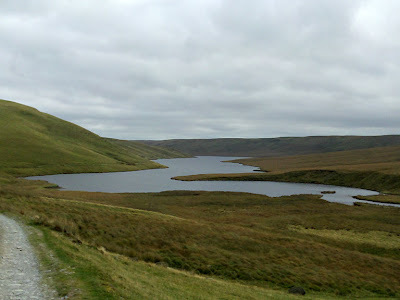 We now had a decision to make; do we continued West and make for the Llyn Teifi lakes or stay on the original route. The route across to Llyn Teifi on the map looked O.K.but on the ground it looked very sketchy and boggy, so we went with the original plan. We re-crossed the river and picked up a sheep track going up and around the back of Claerwen Farm; this brought us out on to the reservoir track, which we had the joy of walking on for the next 4 miles. So far on this trip we haven't see any walkers, we did meet a couple driving at Pont ar Elan but that was all, until the track we finally met a group of D.o.E. We had a rough idea on where to pitch or the night; we found an alternative site but did have to carry 3 litres of water up to it. Two things on this trip I've never seen so much of is sheep and sheep s**t!